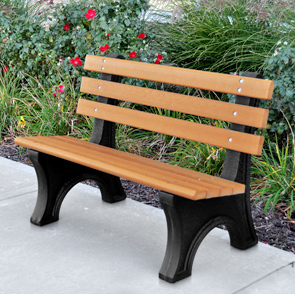 Looking for that comfortable, classically styled weather resistant recycled plastic park bench? The Comfort Park Avenue Benches are ready to be your solution. Made with seven durable 2" x 4" Resinwood slats and sturdy black recycled plastic bases. Two outer slats are rounded for safety and comfort. Available in three lengths and colors. Post-consumer waste such as milk jugs, pop bottles, and plastic bags are the main ingredients in these benches, and to top it all off, the benches themselves are also recyclable. Help reduce the pollution of landfills with chairs that can be enjoyed for generations to come. ►Need a Comfort Park Avenue Bench Fast?